NOTE: Setting your Linksys Smart Wi-Fi Router to Bridge Mode will disable all its router capabilities and turn it into an access point. The router will cease to act as a DHCP server and its built-in firewall as well as the NAT features will no longer be in effect. Alternatively, if you want a more secured network setup and improved network performance without removing your older router’s capabilities, you may choose to cascade your second router to the main router. To know more about cascading, check the LAN to WAN configuration here. For Linksys Smart Wi-Fi Routers, the steps below are only applicable if they are using the classic web-based setup page. If you have a Linksys Smart Wi-Fi, you can set your router to Bridge Mode by following the instructions here. QUICK TIP: The Linksys Connect software features will be disabled on the router once Bridge Mode is set up. If you have set up your router using the Linksys Connect software, you must reset the router to its factory defaults before setting it to Bridge Mode. To do this, press and hold the Reset button for 10 seconds using a pen or a paper clip. Then unplug the router from the power outlet for 30 seconds and plug it back in. Wait for the Power LED to be solid. Connect an Ethernet cable from your computer to any of the numbered ports of the router with Bridge Mode capability. Do not connect anything to the Internet port for now. IMPORTANT: The router that was set to Bridge Mode should remain connected to the main router using an Ethernet cable. Establishing a wireless connection between the two (2) routers in this setup is NOT supported. Plug one end of the power adapter to an electrical outlet and the other end to the Linksys router. Open your web browser and enter your router’s IP address in the Address bar. Press [Enter]. The default IP address of a Linksys router is 192.168.1.1. There will be a prompt for the router’s username and password. Enter the router’s log-in details in the respective fields then click OK. 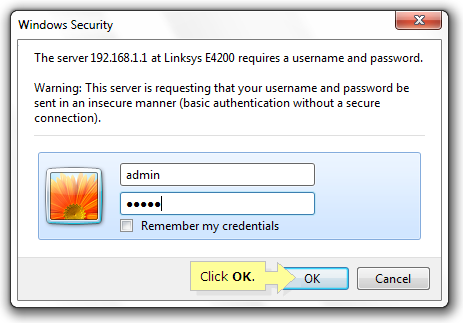 The default username and password is admin. For other router models, the username is left blank while the password is admin. Once a warning window pops up, check the Do not show me this again box and click OK.
You will then be directed to the router's web-based setup page. Under Internet Setup, set the Internet Connection Type to Bridge Mode. 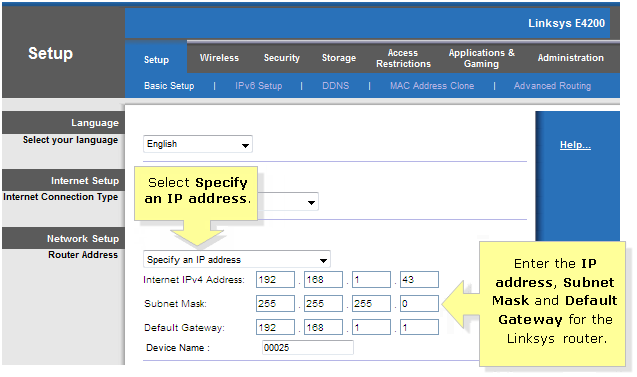 Set the Router Address to Specify an IP address and enter the appropriate IP address, Subnet Mask, and Default Gateway for the Linksys router then click Save Settings. Internet IPv4 Address – address used for the Linksys router. The value for this must be on the same range with the main router (ex. 192.168.1.43). Subnet Mask – must be the same value with the main router. Default Gateway – this is the IP address of the main router. QUICK TIP: The wireless network name (SSID) for each router must be different to avoid conflict for devices which will connect to the wireless network. For instructions on how to set up the wireless network of each router, click here. Your Linksys Smart Wi-Fi Router is now set to Bridge Mode using the Classic firmware. It can now be used as an access point which is helpful in extending your wireless network. Powercycle the router by unplugging it from the power outlet for 10 seconds, then re-plug it after. Upgrade the firmware. For instructions, click here. Reset and reconfigure the router. For instructions, click here.